In X-ray computed tomography (CT), an X-ray source transmits X-ray photons through the patient towards a digital detector that records those photons that pass through the patient without being absorbed or scattered too much. The X-ray source moves around the patient to collect transmission data from numerous view points. In the simplest case, the source goes around the patient along a single circle, called an axial scan. By using a detector with, say, 64 rows of detector elements, one can reconstruct about 64 transaxial images of the patient called "slices." Those 64 slices cover about 4 cm of the length of a patient's body. This is not enough to see the whole heart or head. To cover a longer axial range, the bed can move during the scan, so that the X-ray source traverses a helix (or "spiral"). Such a helical scan can collect over a Gbyte of X-ray data. That data is usually not useful by radiologists in the raw form that is collected by the scanner. The data must be put into a sophisticated algorithm called an image reconstruction method to make the pictures that are ultimately viewed by radiologists. One of the research topics in my research group is developing improved image reconstruction algorithms for X-ray CT. By using better models for the physics of a CT scanner, and better models for the statistics of X-ray measurements, and more sophisticated signal processing methods, we can make better use of the raw X-ray data collected by a CT scanner to produce higher quality images: we can improve the spatial resolution to see finer details, or we can reduce the noise to better see subtle features. Alternatively, by developing improved reconstruction algorithms, we hope to be able to achieve image quality that is at least as good as the images produced by current algorithms but using X-ray scans that have much lower X-ray dose. Towards this end, in Aug. 2014 we were awarded a $1.95M grant from the NIH to develop Model-based image reconstruction (MBIR) methods for improving low-dose CT imaging. This project is a collaboration between my group in ECE and Prof. Tom Wenisch in CSE in the UM College of Engineering, and physicists Mitch Goodsitt, Heang-Ping Chan and Lubomir Hadjiiski and radiologist Ella Kazerooni in the UM Radiology Department. As an illustration of the potential of MBIR methods for CT, the figure below shows a coronal slice of a 3D helical CT scan. The 3D image volume 109 slices, each of which is 512 x 512 pixels. (Each slice is only a 1/4 megapixels, which seems small compared to consumer cameras that now exceed 10 megapixels. But when you have over 100 slices that is still over 25 megapixels all together so the data processing challenges are substantial.) In this case the measured X-ray data (called the "sinogram") included over 7000 projection view angles and the X-ray source circled around the patient about 7 times during the helical scan. 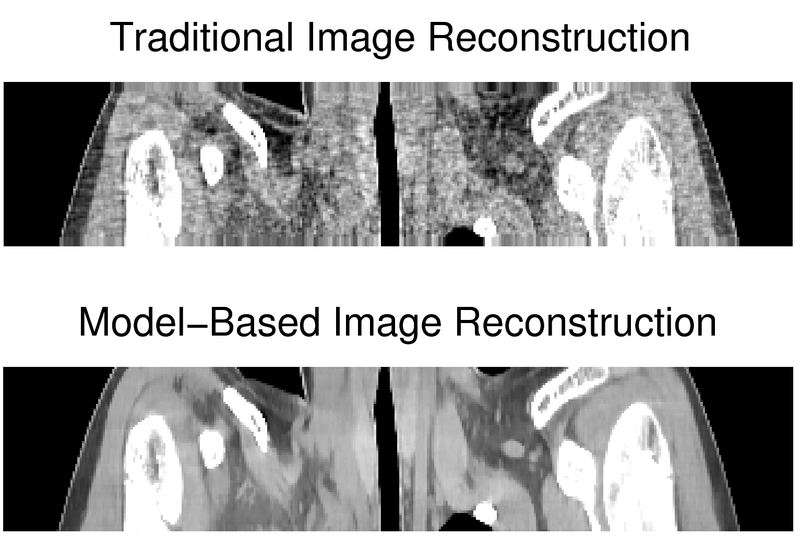 The top image below is a slice from a 3D volume that was reconstructed by one of the conventional image reconstruction methods that are used widely in clinical CT. Commercial CT scanners can reconstruct several slices a second so all 109 slices are produced in less than a minute. Essentially, the images are all ready by the time the patient leaves the scanner room. The bottom image was produced by a MBIR method developed at UM (in collaboration with GE). It uses a penalized weighted least-squares (PWLS) cost function applied to fully precorrected sinogram data with statistical weights that are based on an approximate model for both photon and electronic noise and other effects. We used 20 iterations of an ordered-subsets algorithm with 397 subsets, and an edge-preserving regularized to control noise while maintaining spatial resolution. This particular algorithm, running on an 8-core system, required about an hour to reconstruct the 109 slices. By developing algorithms that are suitable for parallelization across many cores, we can reduce the computation time to make the method more practical for ubiquitous use. This particular slice is through the neck and shoulder region of a patient. The dark strip down the center is the airway leading to the lungs. The bright white regions are shoulder bones. Bones contain calcium that has a higher atomic number than hydrogen, oxygen, and carbon, so bones absorb more X-rays than soft tissue. Evidently the MBIR method produces images that show the internal structures more clearly with less "noise" to confound interpretation. The computational requirements of this application are enormous. We are grateful to the Intel Corporation for providing computing and financial resources that have supported this research in part. In particular, Intel recently provided us with two Grizzly Pass server systems with Xeon Phi co-processors having 60 cores, enabling tremendous parallelization. This type of acceleration will be essential both for research progress and for making these algorithms available clinically. We have also benefited from collaborations with X-ray CT experts at GE Healthcare and GE Global Research.